May 27—Marks the anniversary of Australia’s most successful referendum and a defining event in our nation’s history. The 1967 referendum saw over 90 per cent of Australians vote to give the Commonwealth the power to make laws for Aboriginal and Torres Strait Islander peoples and recognise them in the national census. 3 June—Commemorates the High Court of Australia’s landmark Mabo decision in 1992, which legally recognised that Aboriginal and Torres Strait Islander peoples have a special relationship to the land—a relationship that existed prior to colonalisation and still exists today. 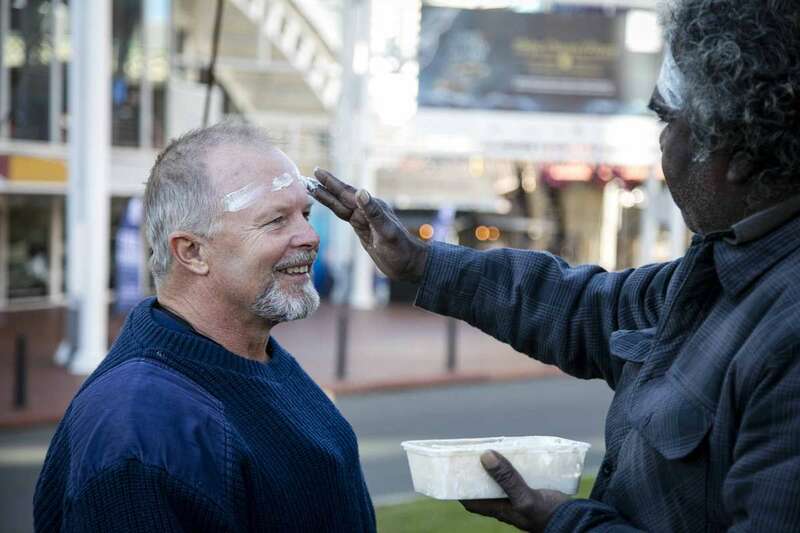 This recognition paved the way for land rights or Native Title. To mark the beginning of Reconciliation Week and to highlight the Australian National Maritime Museum’s strong commitment to reconciliation and acknowledgement and respect of Australia’s Aboriginal and Torres Strait Islanders Maritime culture and heritage, the museum today hosted a flag raising ceremony, flying the Blue Mud Bay sea rights flag for the first time in Sydney. 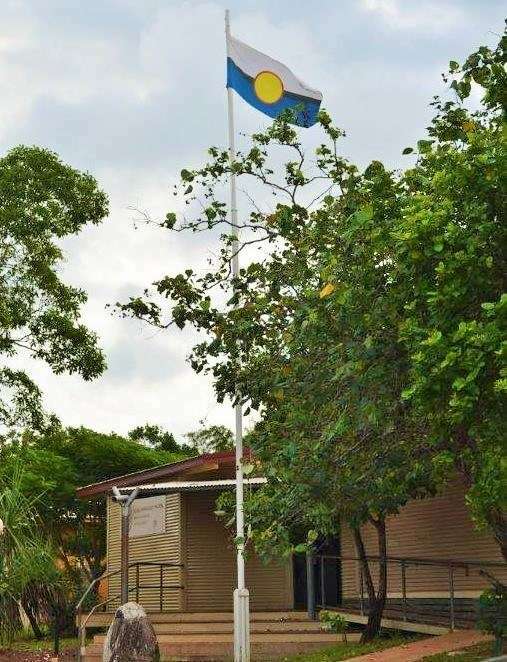 Flying the flag demonstrates the museum’s culture of commitment and acknowledgement of Indigenous people and their assertive right to self-determination in cultural affairs. 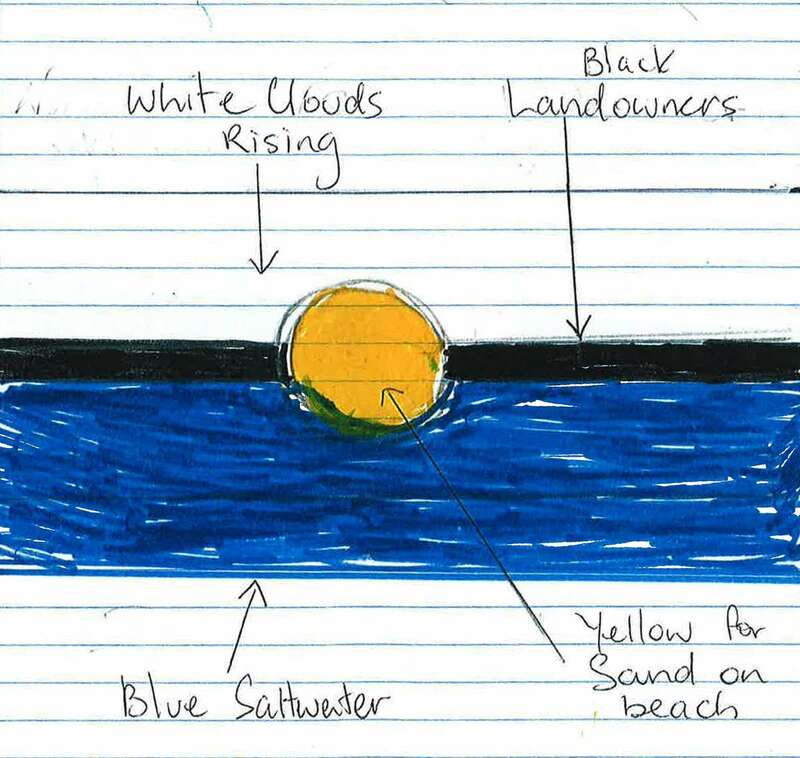 Donald Nuwandjali Marawili’s first drawings working out the design of the new flag – the colours, meanings and best representation to highlight sea rights. On July 2008 the High Court of Australia confirmed that traditional owners of the Blue Mud Bay region in North-East Arnhem Land, together with traditional owners of almost the entire Northern Territory coastline, have exclusive access rights to tidal waters overlying Aboriginal land. 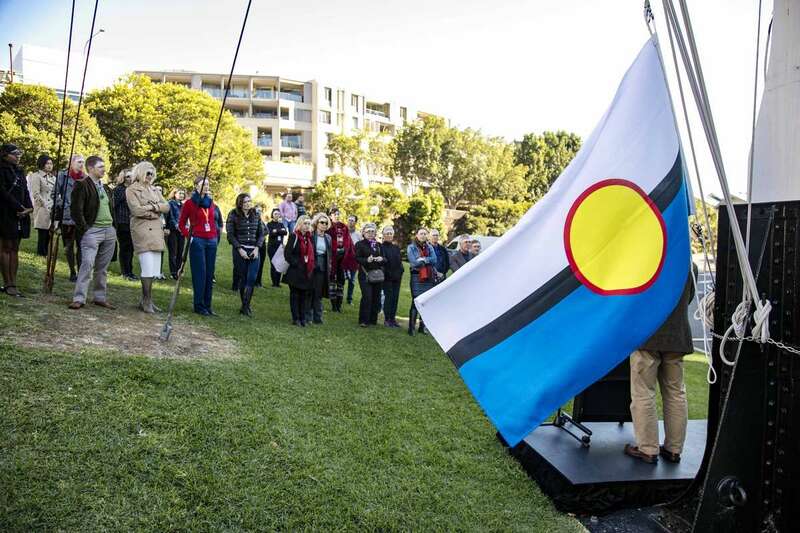 Upon the high court decision community member Donald Nuwandjali Marawili requested that the Northern Land Council assist with the production of a flag for the Blue Mud Bay Celebration and Yilpara and for the future celebration and recognition of sea rights in the Northern Territory. 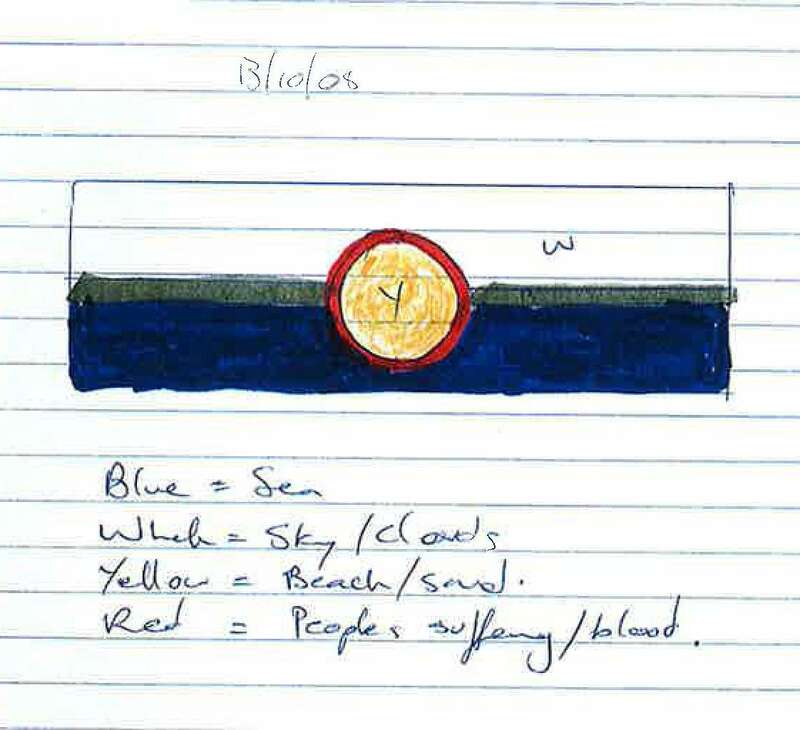 One of Donald Nuwandjali Marawili’s first drawings working out the design of the new flag – the colours, meanings and best representation to highlight sea rights. The cultural narratives associated with the flag is told in part by the magnificent collection of Saltwater Bark paintings of Sea Country of the Yolŋu people held by the museum. These barks are the significant in the Recognition of Indigenous Sea Rights. The Saltwater bark paintings were the first step in a campaign to educate outsiders about Yolŋu knowledge of sea country and the sacred significance of certain places. Following the decision to paint these barks, a number of legal developments lead Yolŋu to take their campaign one step further. 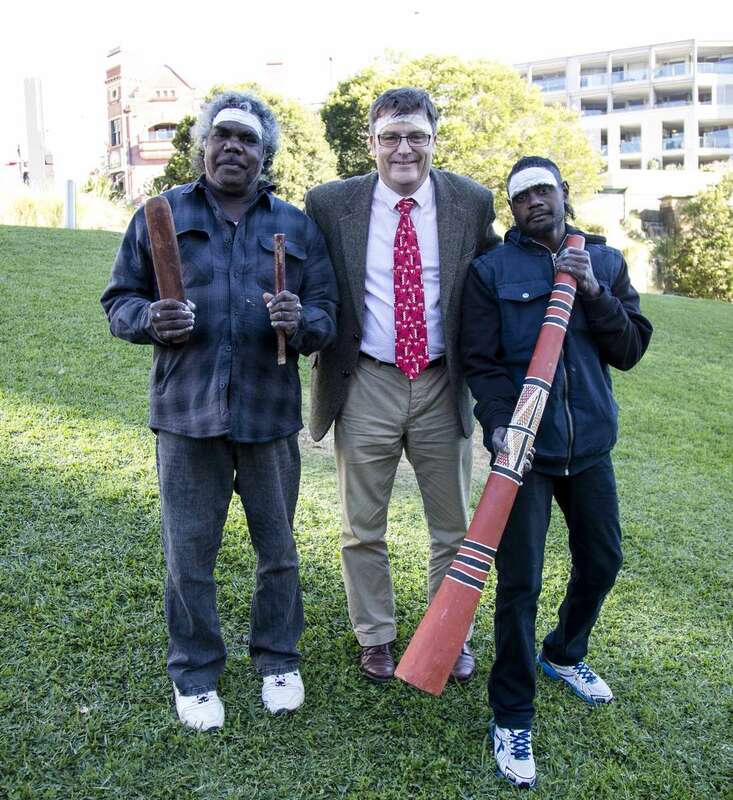 Yolŋu clans from the Blue Mud Bay area initiated a native title case in the Federal Court to gain recognition of their sea rights under Australian law. The first hearings took place at Yirrkala and Yilpara, a homeland centre on Blue Mud Bay. The Saltwater barks painted by the Yolŋu people of East Arnhem Land was an effort by forty seven artists from fifteen different clans to educate outsiders about local Indigenous stories, land ownership and sacred sites. The Yolŋu have been active in the struggle for land rights since the 1960s and these barks represent their attempts to gain legal recognition of their traditional homeland, the Marrakulu Saltwater. The paintings are also a visual and traditional representation of the Yolŋu living and interacting with the sea, depicting camps and sea hunting. 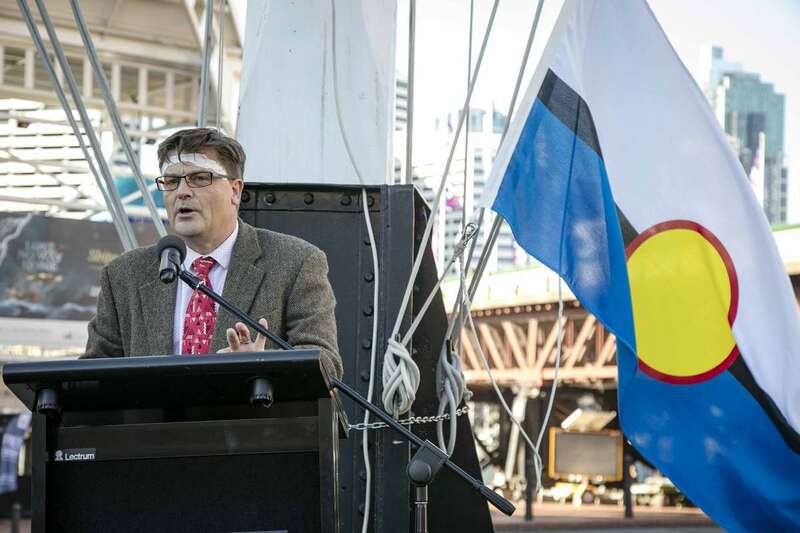 The barks have a political and legal significance beyond their spiritual meaning as they underpin the Yolŋu community’s native sea title claim which was granted in 2008 and known as The Blue Mud Bay decision. 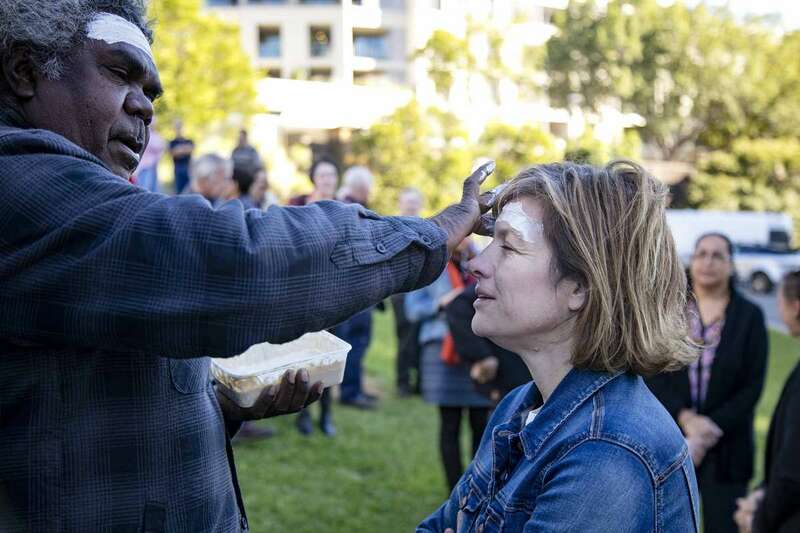 The production of the paintings provided an Indigenous tool for community action that could be created into evidence and used in the Australian legal system. The High Court granted the Saltwater People’s rights, use of the Arnhem Land coast and therefore precedence over commercial interests and fishing. Aboriginal freehold title is now recognised down to the low water mark. The museum is honoured to be the caretakers of the 80 bark paintings that assisted in highlighting the ownership of sea country for the Yolŋu and we are delighted to fly the flag representing this land mark decision and event for Yolŋu and the wider Australian community. 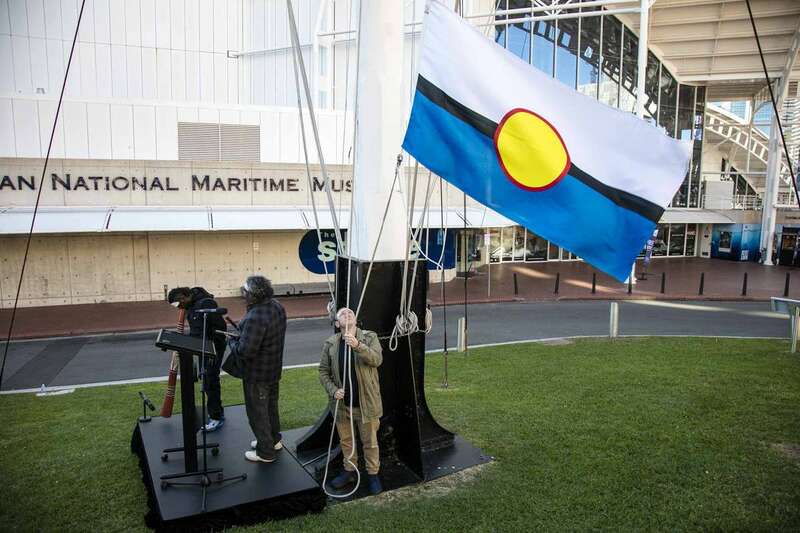 The ceremony took place at the Australian National Maritime Museum at 9.30am, Friday 27 May 2016 with the flag being raised by its creator, Mr Donald Nuwandjali Marawili and assisted by Yidaki (Didgeridoo) player Djuwakan Marika. Our exhibition Munuk zugubal Saltwater Songlines runs until 31 August 2016 and explores how Aboriginal and Torres Strait Islanders people navigate their way across the lands and waters by singing or dancing the path of the creator beings, passing down this knowledge from generation to generation. Beau James is from the Mununjali clan of the Yugambeh Nation from SE Queensland with links to Stradbroke Island. Currently working as the Indigenous Programs Manager for the Australian National Maritime Museum their responsibilities include the development of cultural programs, events and exhibitions focusing on the Museums Indigenous collection. Working collaboratively with communities, artists and art centres throughout Australia they have curated innovative exhibitions both nationally and internationally and sourced exciting new works intertwining the traditional with the contemporary to further highlight and explore Indigenous culture and connection to Saltwater, Freshwater country.